EOF Application of Oil Filter on SD-HSHINI Honeycomb Dehumidifier SD-HChanges for Parts and Components Development DepartmentSTM-940HPW / High Temperature And High PressureSTM-W / STM-PW / Water HeaterDiversify New Territory; Realize One-stop ShoppingHow to Select Plastics Auxiliary Equipment ─ Drying and DehumidifyingSHINI Central Material Processing SystemIntroduction of Basic Knowledge on RefrigerationAbout Pneumatic Conveying Business DepartmentAbout Shini VietnamSingle Axis Servo Driven Robots ST1Solution for Chilling Power Reducing of SIC-8W Water ChillersPET Application and Brief Analysis of ManufactureImpressive Tour of ZhangjiajieSHINI HOT RUNNER SYSTEM: R&D for Numerous, Precise and ExcellentERP Go-Line Enables SHINI to Advance ManagementIT Service Management Training of Information ApplicationCongratulations on Establishment of Shini-Syncro Extrusion Process Control (Dongguan), IncReport on the Establishment of Shini Water Chiller Performance LaboratoryPowder-removing Hopper SHR-CR-3UPortable Water Chiller SIC-3A~12.5A-R2Three Axes Servo Driven Robot (telescopic type) ST3-TSuccessful Application 2: ShengMei Chilled-water SystemBarbecue and Farewell Party for Chris ChangAbout Shini USAShini Self-developed Magnetic Drive PumpHow to Select Plastics Auxiliary Equipment ─ Feeding and ConveyingShini Group 41st Anniversary and Pinghu Factory Grand OpeningHAD Heatless Air DryerSCD-ES Successful Application of PET Regrind Material Processing SystemSuccessful Application of PET Virgin Materials + Regrind Materials Processing SystemSuccessful Application of PET Regrind Material Processing SystemPrinciple Analysis on Honeycomb-rotor DehumidifyingHow to Select Plastic Auxiliary Equipment — Heating and Cooling4 Components Volumetric Dosers SCM-4Successful Exploitation of Temperature ControllerApplication Occasions for Hot Runner SystemTrouble-shooting for SICC-W Central Water ChillersThe Thickness Control and Auto Air Ring Technology of the Blown FilmBarbecue in Litchi Garden12th DMP Ends Completely & SuccessfullyIntroduction to Pinghu Shini Powder Painting LineSuccessful Application of SDL-U-HDApplication of Air-cooling Chamber on Plastic MoldingAir-cooling Chamber SACC-3000Precision Assembly Supply Center Founded in Shini DongguanIntroduction to SGB Vertical Cone-dosingApplication Occasions for Hot Runner SystemHow Thermal Expansion Valve Works in RefrigerationCauses and Countermeasures for Refrigeration System Blockage“Large Flow” Water Heaters STM-2430WFWater Heaters STM-WApplication of Extrusion Control in Officinal Flexible PackageShini is Awarded New Version ISO CertificateShini Braces for OA Roll-out Throughout the GroupHot Runner System OptimizationHow Evaporator Works in RefrigerationHow Hot-air Bypass Solenoid Valve Works in RefrigerationIntroduction to SICC-A Module Combination2011 Canton Fair ReviewHow to Make Hot Runner Fully UsedHow Compressor Works in RefrigerationMaintenance of DehumidifiersWater-cooled Chillers SIC-14W-R2Air-cooled Water Chillers SIC-7.5A-R2“Large Flow” Water Heaters STM-2430WFWater-cooled Water Chiller SIC-56W-R2The Future is in Plastic and Rubber---CHINAPLAS2012PET Preform SystemThe Relationship between Heat Conduction and Heat Loss"Large Flow" Water Heaters STM-4875WFAir-cooled Water Chillers SIC-24A-R2Air-cooled Chiller SIC-18A-R2Central Conveying System ApplicationMedical and Optical System SolutionThe Principle and Application of Industrial Air ChillerCold Mold Sweat DehumidifierSolutions of Central Cooling SystemThe Application of Honeycomb DehumidifierTemperature Control of Hot Runner SystemCentral Granulator SG-70The Case of Large-scale System of Dehumidifying and Drying Combined with Central Feeding SystemStorage SiloThe Application of P.I.D. 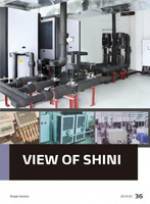 Temperature Control System in Plastics Auxiliary EquipmentThe Successful Application of Shini Central Chilling Water SystemPreview of Machines for Chinaplas201428th ChinaPlas Ends Completely & SuccessfullyShini Launches Modular Dryer SSMD-UShini Gravimetric Blender SGB Flakes SolutionGravimetric Blender SGB Data-collection SoftwareOil Filter Applied in Plastics Drying and Dehumidifying"Large Flow" Heater STM-FThe Preview of Shini Auxiliary Equipment on Chinaplas2015 ShowTeflon Coating Applied in SGBApplication of Shini Drying and Dehumidifying SystemMold Sweat Dehumidifier SMD-2000HThe PET Crystallizer SCR ImprovementWorking Principle and Practical Implication of Cyclone SeparatorMy Chinplas2015About Shini RussianThe 29th ChinaPlas Ends Completely & SuccessfullyTemperature Control for Water Chiller Outlet WaterApplication of Air-cooling Chamber on Plastic MoldingNotice for Pipe Connection of Mould Temperature Controller and MouldHot Runner’s Importance and Development TendencyApplication of Energy-saving Technology in Drying and Dehumidifying EquipmentPrinciple and Application of Pneumatic Conveying TechnologyShini Robots Used in North AmericaMake Your Imagination Thousands of SurprisesReview 2015 and Look Forward to 2016Model Selection and Notices of Cooling TowerEnergy Saving Technology Applied in Water ChillerRotary ValveMold Sweat Dehumidifier SMD-3000HExhibition News of Chinaplas2016Large Flow Oil Heater STM-3050FApplication of Auxiliary Equipment in MIMThe New Technology of Shini Water ChillerFilm Extrusion Process and Collocation of Extrusion EquipmentThe Selection and Application of Hot Runner SystemSTM and Extruder Integrated ControlCase Sharing of Central Conveying SystemShini Modular Dryer Used in Pelletizing IndustryPositive Pressure ConveyorExplanation of Hot-runner TechnologyReports after K2016ClassifierMy Shini LifeDust Separators SDS-500“Large Flow” Water Heater STM-WFNApplication of Valve Hot RunnerCase Sharing of Central Conveying SystemCase Study of Pneumatic Conveying SystemDetailed Analysis of Hot Runner Technique - Optical LensA Case Study on Central Conveying SystemAn Experience Sharing of Central Conveying SystemAn Experience Sharing of Workshop LayoutAutomatic Batching SystemAn Experience Sharing of Central Conveying System--Terminal ElementsThe Significance of COP to Cooling SystemCase of Plant Solution for Doors and Windows Motor ProductsPump GroupHot Runner SystemsVehicle Lamps of Central Conveying SystemHow to Control the Moisture of Plastic Materials Effectively?Details of Shini Granulating CutterCase of "Large Flow"Water Heater STM-910WF ApplicationIntelligent Flow Regulator SIFRCFC-free Refrigerant Water-cooled Water Chiller SIC-17W-R2Application Case of Hot Runner Multi-head Nozzle with PC MaterialsApplication of Industrial 4.0 Smart PlantIntelligent Flow Regulator —— Your Flow Controller! 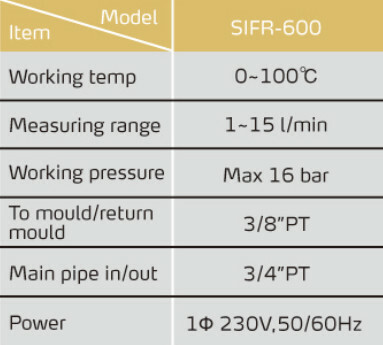 1.Digital flow and temperature monitoring system is able to process real-time control of the flowrate, temperature in each pipe, which can display instant mould loop blockage to avoid the rejects. 2.The regulating value in each return loop can control precise flowrate in each loop by adjusting different water loops. 3.7” touch panel presents clear display of simple operations. 4.The display of graphic and numerical data enables more intuitive adjustment of the return loop. 5.Alarms for real-time flowrate and temperature monitoring indicate abnormalities in the loop in time. 6.RS485 communication interfaces make centralized monitoring with the host units available. 3/8” quick hose coupler,quick pipe connector,Teflon tube connector, Floor mount are optional. 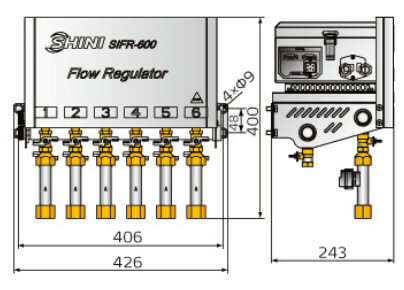 Circulating water enters the flow regulator through the water inlet. 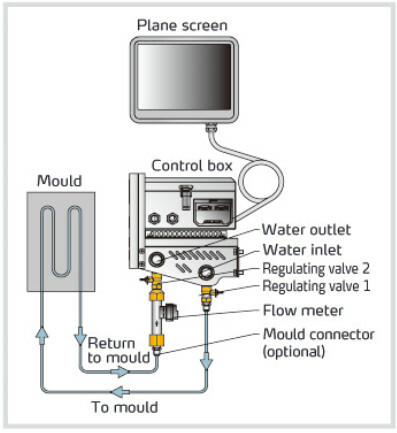 Circulating water enters the mould via the regulating valve 1. When circulating in mould, the water enters the flow monitor via the valve 2 of the regulator, and the water flowrate and temperature data are monitored by the electronic flow meter. The circulating water then returns to the water heater, water chiller or cooling tower through water outlet. 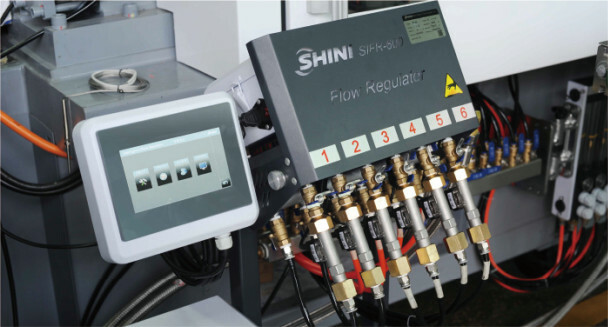 The data detected by the flow meter will be connected to the panel screen in display.